Commonly encountered and ecologically important, the mushroom genus Laccaria (Basidiomycetes, Agaricales) is a model for investigating the role of ectomycorrhizal (ECM) fungi in forest ecology and the evolution of ECM fungal genomes. 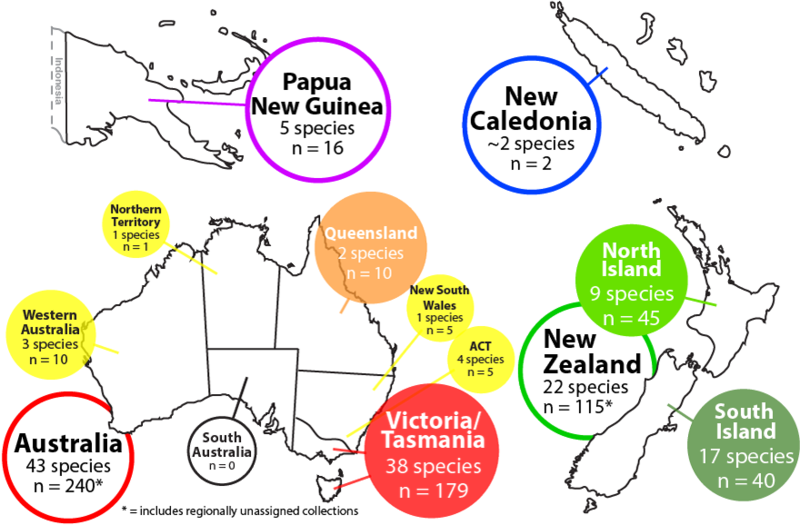 Preliminary analyses suggest that Laccaria diversity in Australasia is significantly higher than what is currently described. Recent regional sampling has more than doubled the known diversity of the group. The high number of under sampled habitats and continued discovery of cryptic species emphasizes the need for continued fieldwork. This site presents our current knowledge of Australasian Laccaria. Many putative species recognized through our molecular analyses await further research, and are not yet fully described or published. © Chicago Botanic Garden. All rights reserved.